The opening shot of Moonrise Kingdom is of a wall with a picture of a house mounted on it; we then travel around this cosy yet well-appointed two-storey and are introduced to its inhabitants in a series of camera pans and long dolly shots. Why yes, Wes Anderson IS the director. How’d you guess? Few directors can inspire such strong responses in both his admirers and detractors as Wes Anderson. His critics see his repetitive camera moves and offbeat plots as being overly quirky with little going on underneath. His adherents will bask in the warmth of the storytelling, the minor insanities of his characters and his clear love of the French New Wave. Moonrise Kingdom will do absolutely zilch to convince his critics otherwise, but why change now? His last feature, Fantastic Mr. Fox, saw Anderson apply his trademarks to the stop-motion animation process. 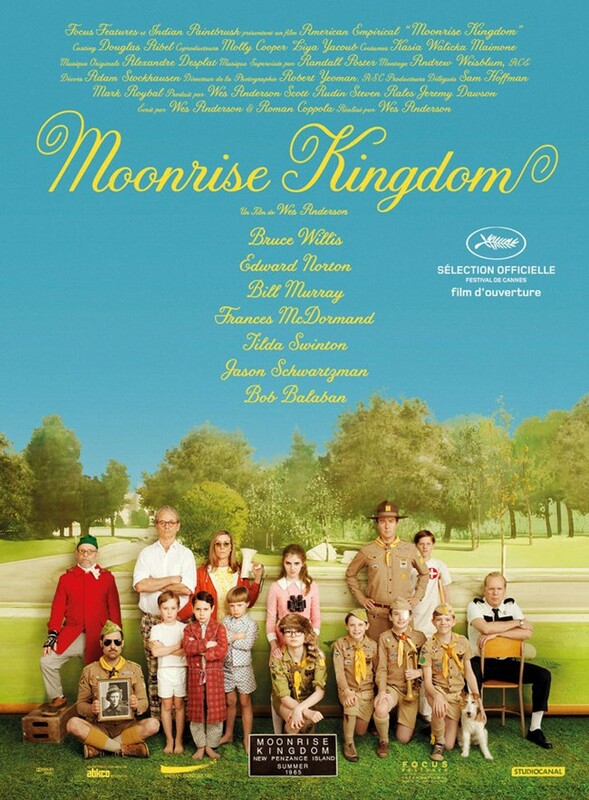 With its abundance of beiges and determined lack of swearing, Moonrise Kingdom feels like a cartoon made flesh. Imagine if Russell from Up were a few years older, was put on Ritalin and had earned all his merit badges, and you’d get Sam Shakusky (Jared Gilman). An orphaned boy scout, he goes on the run from his island scout camp with local lass/pen pal/soulmate Suzy Bishop (Kara Hayward). In their debut film roles, their underplayed delivery is perfect, since no-one except Bill Murray ever knowingly overreacts in a Wes Anderson film. Murray plays the father to Hayward’s young tearaway, and is just one of a number of folks searching for the star-crossed non-lovers (They’re only 12, after all, though they do share one of the most hilariously awkward kissing scenes to come along in quite a while). Also looking for them are Mrs. Bishop (Frances McDormand), the local police captain Sharp (Bruce Willis) and scoutmaster Ward (Edward Norton) and his ever-prepared troop. The adult actors clearly relish the chance to send up their images (Willis and Norton are a long way from Die Hard and Fight Club here), whilst the children are all utterly engaging, brimming with scary levels of confidence. A cartography-inclined narrator, played by a bearded Bob Balaban, is the icing on a sweet little cake. Seriously, you’ll want to pop him in your pocket and take him home as a pet. Anderson and Roman Coppola’s script imagines a sweet little island haven in 1965 that borders on the twee (No roads, only dirt-tracks, switchboard communication) but has such an attention to detail that you just can’t help but fall for it. It may see Anderson at his most Anderson-esque, but Moonrise Kingdom’s simple story of young love also sees Anderson at his warmest and most accessible. If you do have a prejudice against the overhead shots and samples of ‘60s French pop, your loss. The most memorable action films have wonderfully simple set-ups. Die Hard was one man against a dozen in a skyscraper. The Wild Bunch was a trigger-happy gang go for one last job. 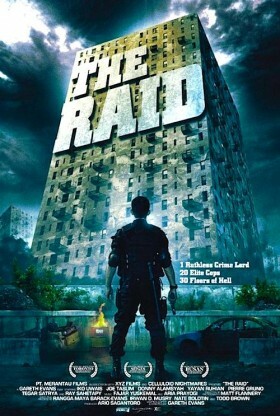 The Raid is 20 cops, loads of criminals and a thirty-story tower block. Blend these simple ingredients with some lightning-paced chop-socky and indulge in a flick that is best described as batshit crazy, but in the best possible way. The opening of The Raid sees Sergeant Rama (Iko Uwais) exercising, praying and kissing his pregnant wife goodbye before heading off to join his SWAT team on their latest mission. Yes, this is our hero. Clichés threaten The Raid frequently from the shadows, but they simply don’t matter. As soon as you start to think in any way deeply about the characters, Uwais and director Gareth Evans grab you by the neck and throttle your senses until you submit to the almighty chaos. The cops assemble around the 30-floor apartment block ruled by drug lord Tama (Ray Sahetapy) and then they breach the perimeter. Once the SWAT team get inside, mayhem ensues. Their initial plan to take the place quietly floor by floor goes awry, and seemingly countless henchmen come at them with guns, machetes and their fists. The police, though outnumbered, are forced to respond, and Rama is determined to get home alive by any means necessary. From the moment the team enter the complex to the final few expository moments, The Raid is a breathless, delirious and uncompromising piece of action film that leaves so many other pretenders in the shade. Both cops and criminals are versed in Pencak Silat, an Indonesian martial art that is more brutal than balletic. Combined with knives and guns, it becomes a lethal force that pins people to the wall and audiences to their seats. A fight between Rama and gang members Andi (Donny Alamsyah) and Mad Dog (Yayan Ruihan) will leave you open-mouthed in disbelief. Before that, however, watch as Rama hacks, chops and slices his way through a huge cast list with bravura. Seriously, stay for the credits and see how many guards/fighters/attackers all succumb to Rama’s talents. Blood flows freely in the fight scenes, some of which result in images and moments you won’t forget. In moments of desperation, the characters in The Raid find unorthodox use for such things as broken doorposts, butter knives and fridges. You have been warned. Director Evans, a Welsh emigré living in Jakarta, takes unashamed influence from all kinds of sources; from Bruce Lee to John Carpenter (think Assault on Precinct 13 across 30 floors), from Sammo Hung to Sam Peckinpah. Meanwhile, Uwais’ reflexes and boyish looks make him a bona fide action star. The Raid is not subtle, but it’s proud of its influences and unique in its storytelling, fevered and relentlessly energetic. The bloodshed of The Raid will send your blood pumping through your veins at light speed!